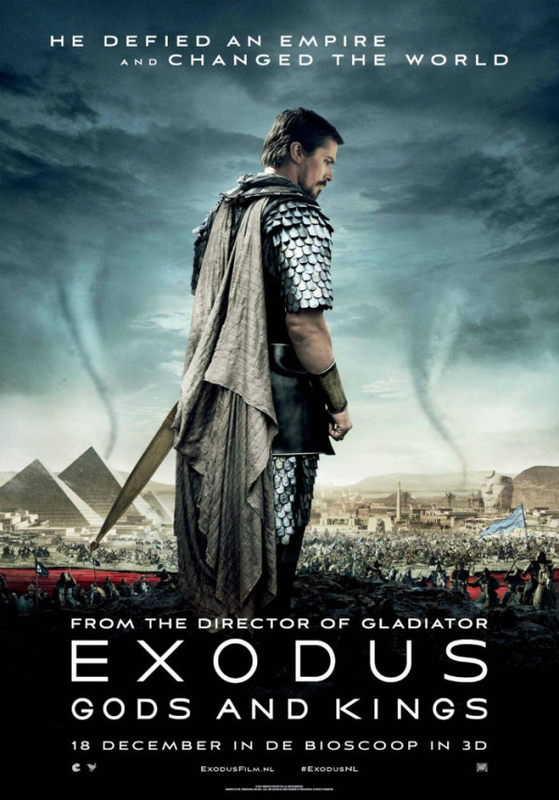 Ridley Scott’s version of the Exodus story that focuses on the relationship/rivalry between Moses (Christian Bale) and Ramses (Joel Edgerton) reminded me a bit of the dynamic between Christian film-goers and secular Hollywood films, like Exodus, which attempt to adapt the Bible to the big screen. Raised as brothers and princes of Egypt in the palace of Pharaoh senior, (John Turturro) the two spend most of the movie opposing each other–Moses, as the more benevolent taskmaster and favorite of his step-father/pharaoh, and Ramses, the uncaring, cutthroat heir to the throne. The Christian audiences can sometimes act like Ramses: stubborn, grumpy, vengeful, closed-minded and unwilling to listen to someone they’ve already decided is an enemy. They can also be a bit hardhearted and skeptical, looking only for what the filmmaker gets wrong and looking for every reason to punish the secular outsider who has the nerve to tell a story that isn’t theirs. This approach would call foul on all sorts of things: No baby Moses in the Nile scene; instead of Moses holding a staff, he wields a sword and fights with the Egyptian army; no turning his staff into a snake; Moses portrayed as the spokesperson for the Hebrews while Aaron has almost no lines; no repeated utterances of “let my people go”; and every other deviation they pick out from the narrative in the book of Exodus. But most of all, the film had the audacity to depict God as (spoiler alert!) a zealous, wrathful 11-year-old British boy. Though Exodus: Gods and Kings doesn’t take as many artistic liberties as Darren Aronfosky’s Noah, it still won’t be an easy sell for by-the-book evangelicals. But with an atheist director and a lead actor who suggested Moses could be seen as “schizophrenic” and “barbaric,” (http://www.jewishjournal.com/the_ticket/item/christian_bales_moses_in_exodus_insecure_schizophrenic) we should not be surprised at the Biblical inaccuracies in the film. What surprises me even more though, is how these same evangelical Christians who are so critical of films like Exodus: Gods and Kings, will praise films like History Channel’s “The Bible” mini-series and the “Left Behind” movie, (That have just as many inaccuracies) simply because it was produced by professing Christians. I tend to view films the same way I go grocery shopping. While pushing my grocery cart through the store, there many things that I like and place in my cart, while there are other items that I would never eat, so I leave those items on the shelf. Plot deviations and Biblical inaccuracies aside, key themes of the Exodus story are still there. Moses is rightly portrayed as a reluctant and rough-around-the-edges leader, though ultimately faithful to his calling. I was also pleasantly surprised that characters in the film used the Hebrew pronunciation of Moses’ name, (Moshe) interchangeably with the English pronunciation. In my humble opinion, this film employs all the cinematic tools at its disposal to create a breathtaking world that would certainly make Cecil B. DeMille stand up and cheer. And although Ridley Scott made the controversial choice to depict God as a young boy, (11-year-old British actor Isaac Andrews) who is only visible to Moses, it makes sense to me. Before you shout heresy, ask yourself: If you were a filmmaker, how would you visualize God in a movie? Would you use James Earl Jones’ Darth Vader voice booming from the sky? Or would you prefer to have Morgan Freeman appear in his all-white suit? Doesn’t Luke 18:17 tell us that anyone who will not receive the kingdom of God like a little child will never enter it? So what better choice is there to depict God than as a child? What if we let our skeptical, hardened hearts be softened by considering what is good, true, beautiful, admirable or praiseworthy about the film? (Philippians 4:8) What if instead of posting nitpicky complaints as the theological police, Christians extended compassion as the people of God, grateful to see parts of the Bible’s story told on screen? Any filmmaker telling this story must make an artistic decision, and though it may not be perfect, I found Scott’s choice to be compelling and interesting, in a good way. Very few filmmakers can make the Bible as cinematic as this film does, and with the help of thousands of CGI artists, the supernatural onslaught of frogs, flies, hail and bloody water shows the plagues scenes in a way that brings Exodus chapters 7-11 come to life. Similarly, the climactic parting of the Red Sea sequence is absolutely epic and awe-inspiring. Christian Bale admitted to having no idea about Moses at all before agreeing to play the character in Scott’s take on the story of the Exodus and said he studied in depth not only the Pentateuch, (The first five books of the Bible) but also the Torah and the Quran in preparing for the role. Consider that some of the secular moviegoers in the audience may also be inspired to look up the Biblical account of Exodus after seeing this film. Isn’t that a good reason to let your skepticism go? Are we suffering from spiritual Alzheimer’s?